The 2013 National Championships hosted by the USGTSDA will be held June 21-22 in New London, CT on the campus of Connecticut College. Join us and connect with friends and fellow Tang Soo Do practitioners from around the country. 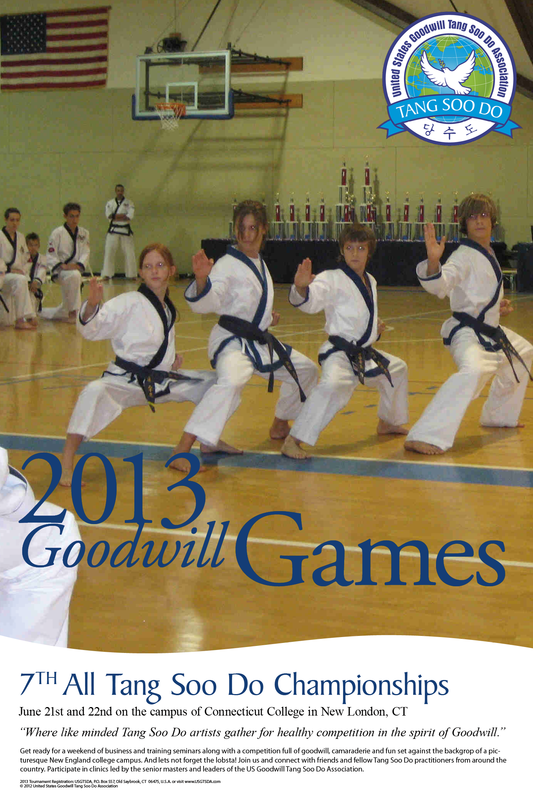 Participate in clinics led by the senior masters and leaders of the US Goodwill Tang Soo Do Association. Scroll down to learn more about the event venue, tournament schedule, hotel information and for an interactive google map. 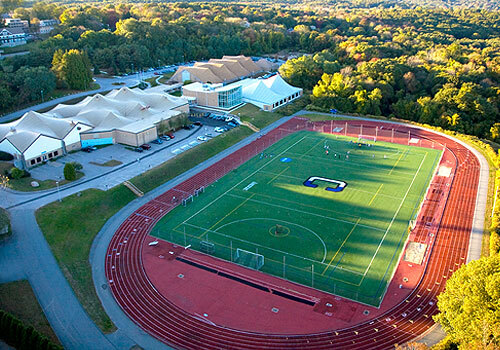 Get ready for a weekend of business and training seminars along with a competition full of goodwill, camaraderie and fun set against the backdrop of a picturesque New England college campus. And let's not forget the lobsta! 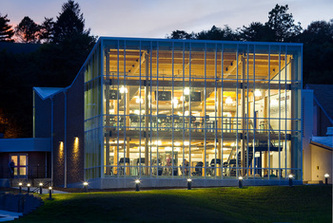 The Tournament will be held at the Charles B. Luce Field House, part of Connecticut College's multi-purpose athletic facilities that include Jane Cadwell Lott Natatorium (lap swimming), Dayton Arena (ice skating) and Silfen Track & Field Complex. The main field house consists of a 22,000-square-foot Pulastic playing surface that holds three multi-purpose courts for badminton, basketball, tennis and volleyball. There are four squash courts, two racquetball courts and a climbing wall. The main wood-court gymnasium serves as the home arena for the Camel men’s and women’s basketball and volleyball programs. The bleachers can hold up to 1,000 fans. The field house was dedicated in September of 1992 and received $1.6 millon in renovations completed last summer. 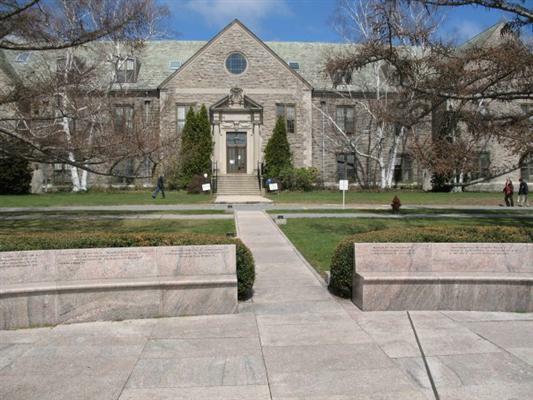 The upgrades are characteristic of the transformation Connecticut College has undergone over the last several years as it has restored historic buildings, renovated student residences and enhanced the natural beauty of its 750-acre Arboretum campus. 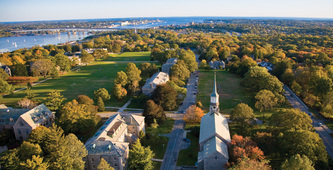 Situated on the coast of southern New England, Connecticut College is a highly selective private liberal arts college with 1900 students from all across the country and throughout the world attracted by rigorous academics and a comprehensive residential life program, as well as the diverse opportunities to explore their interests through funded internships, community service or international study. 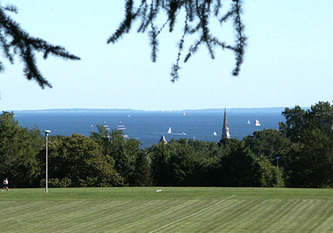 On the college’s 750-acre arboretum campus overlooking Long Island Sound, students and faculty create a vibrant social, cultural and intellectual community enriched by diverse perspectives. 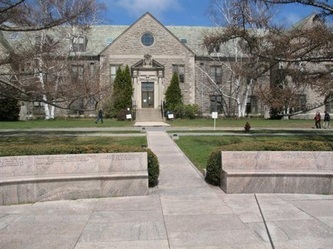 The college, founded in 1911, is known for its unique combination of interdisciplinary studies, international programs, funded internships, student-faculty research and service learning. 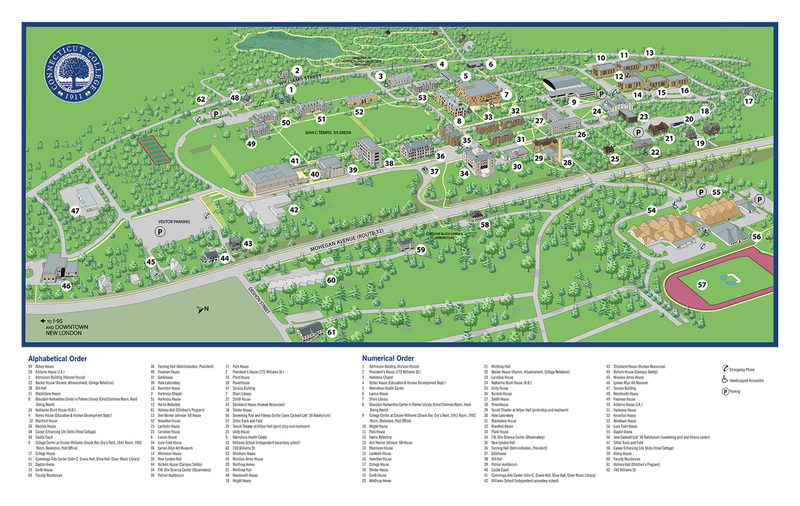 For more information, visit http://www.conncoll.edu/. Clawed lobsters comprise a family of large marine crustaceans (that are delicious!). They have long bodies with muscular tails, and live in crevices or burrows on the sea floor. Three of their five pairs of legs have claws, including the first pair, which are usually much larger than the others. Highly prized as seafood, lobsters are economically important, and are often one of the most profitable commodities in coastal areas they populate. Although delicious, in North America, the American lobster did not achieve popularity until the mid-19th century, when New Yorkers and Bostonians developed a taste for it. Prior to this time, lobster was considered a mark of poverty or as a food for indentured servants or lower members of society in Maine, Massachusetts and the Canadian Maritimes, and servants specified in employment agreements that they would not eat lobster more than twice per week. Can you believe that? Don't miss out on a visit to Abbott's Lobster in nearby Noank, CT during your visit for the Nationals. For other dining choices, check out these Yelp picks in Groton, New London and Mystic, CT. Check back often for updated information about the tournament, clinic, registration and travel information. 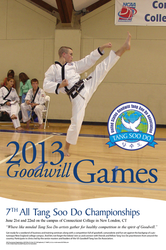 Promote the 2013 Championships in your school with one of these three commemorative posters. Download a full size printable file. These posters can be printed at Costco for your school for only $10 each (prices may vary). 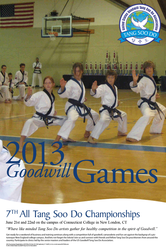 To demonstrate proper Moo Do discipline and promote Goodwill between participants all competitors and judges are encouraged to be in uniform and in line early for opening ceremonies Saturday morning and remain for closing ceremony Saturday afternoon. 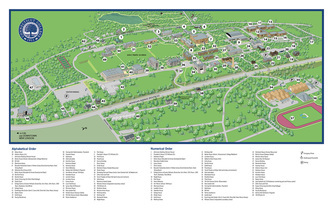 All events held at Connecticut College Charles B. Luce Field House unless noted otherwise. Check-in desk will close promptly at 9:00 AM; those who don’t check-in will not be eligible to compete. All times estimates; schedule subject to change. Train with Grandmasters and Masters from around the US (all ages and ranks) in two back-to-back clinics on Friday night. 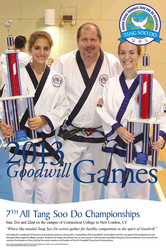 Choose from subjects including advanced tang soo do forms, walking cane form, self-defense, tournament forms presentation, and gracie combative techniques. Click here for instructor and clinic information. Competitors ....................................................... Included with Registration! Connecticut College is just 51 miles from TF Green Airport in Providence, RI which is the most convenient access to Southeastern CT. Use airport code PVD when searching for flights. Hartford's Bradley International Airport is only 65 miles from the tournament site. Use airport code BDL when searching for flights. For those of you with private jets, Groton-New London Airport (GON) is a mere 7 miles away (commercial flights no longer available). 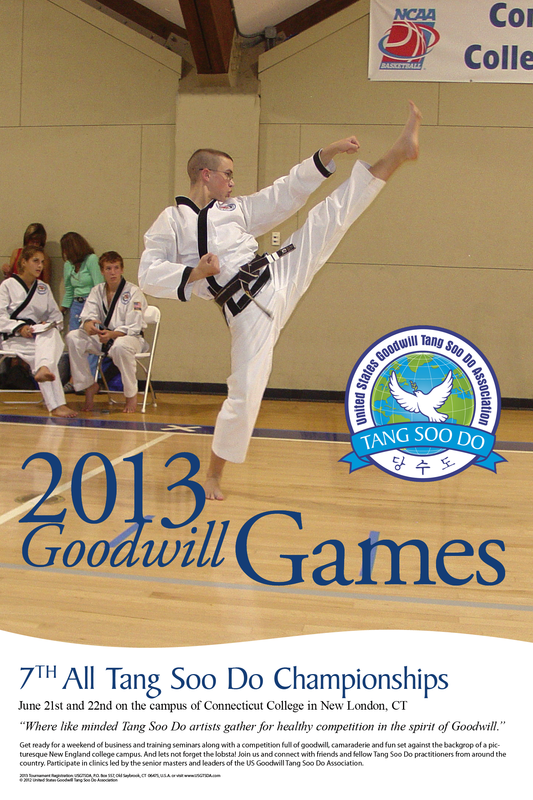 The United States Goodwill Tang Soo Do Association is pleased to offer the following BLOCKED ROOMS / HOTEL ACCOMMODATIONS. Reservation cut-off date is May 20, 2013. Please use group name USGTSDA Nationals. Hotel information provided by Hotels.com. 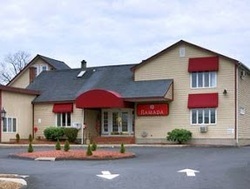 Ramada Inn has a full-service spa, an indoor pool, a spa tub and sauna. Wireless Internet access is complimentary and business amenities include a business center and a meeting/conference room. This hotel offers a restaurant and a bar/lounge. Guests are served a complimentary breakfast. The staff can provide event catering and business services. King and two double bedrooms are available. Hampton Inn has an indoor pool and fitness facility. Complimentary wireless Internet access is available (wired access in guest rooms). Business amenities include a business center and small meeting rooms. A complimentary breakfast is available. King and two double bedrooms are available. Quality Inn has an indoor pool, a spa tub, and a fitness facility. Complimentary wireless Internet access is available and there is a business center on site. A complimentary breakfast is available. King and two double bedrooms are available. 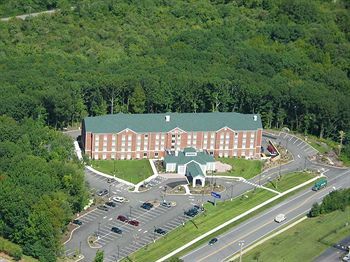 Clarion Inn has an indoor pool, a spa tub, and a fitness facility. Complimentary wireless Internet access is available and there is a business center on site. A complimentary breakfast is available. King and two double bedrooms are available. Hilton Garden Inn has a restaurant, indoor pool, a spa tub, and a fitness facility. Complimentary wireless Internet access is available and there is a business center on site. A complimentary breakfast is available. King bedrooms are available. 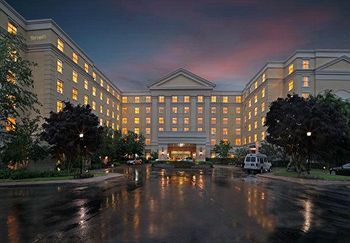 Mystic Marriott Hotel and Spa has a full-service spa, an indoor pool, and a spa tub. Wireless high-speed Internet access is complimentary in public areas (surcharge for in-room access). This 4-star hotel features a business center with small meeting rooms. The hotel offers 2 restaurants along with a coffee shop/café and a bar/lounge. Additional amenities include spa services, a fitness facility, and a steam room. King and two double bedrooms with pillowtop mattresses. This is a smoke-free property.